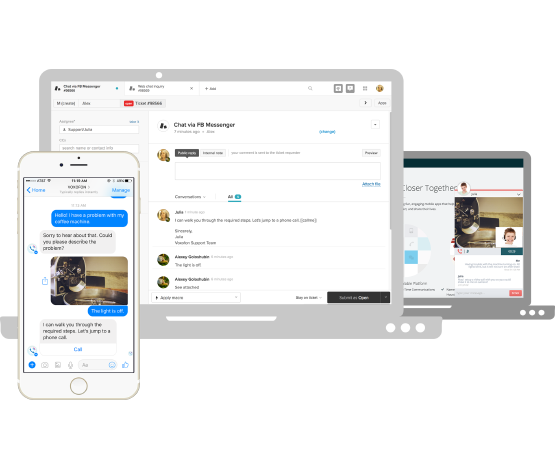 Convenient, frustration-free communication, real time with live chat or asynchronous with SMS and messaging apps. Messages are delivered directly to the customer. Customer can change channels as needed, move the conversation from live chat to Facebook Messenger, switch to Voice, then go back to Messenger or SMS. Agent works with an aggregated case feed - every message from each channel appears in the existing support desk, and is appended to the relevant ticket. No multitasking!! All communication stays in one place. Context is maintained within the case regardless of what channel the customer chooses. Messages from multiple channels stay in one case feed. Give Them SMS & Messaging! AssistHub enables efficient communication between customers and businesses, and is intuitive both for agents and customers.